Uto's Usability Enhancements Cheers to Radrose! 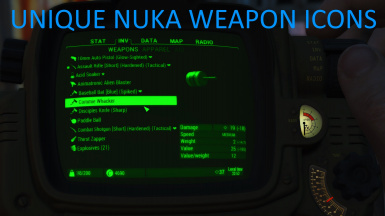 Neanka - The creator of the original DEF_HUD, DEF_INV, and DEF_TOLS that have improved the Fallout 4 experience so much for so many people. 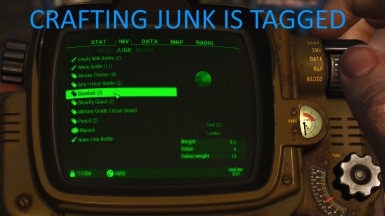 Made tag usage consistent across patches - Shipments, Nuka drinks, etc. Updated Wasteland Venturers patch for the new Wasteland Venturers 2! Fix for certain types of Grenades and Mines not being visible in trade and barter screens. Fixed some item names, scrap descriptions, and inconsistent weights. 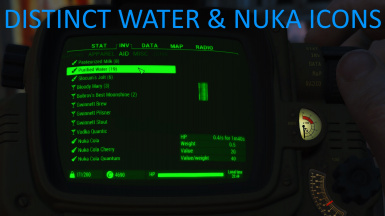 Sim Settlements supported version 2.0.3 now shown correctly in installer. Fixed We Are The Minutemen non-AE selection mistakenly installing the AE patch. Fixed Missy II being misidentified as Missy I. 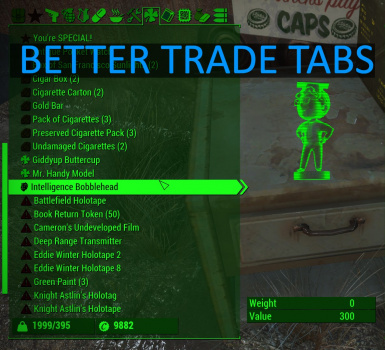 Fixed "Valuable" junk not showing up in trading tags. Added Misc "Vase" tag, Perk tags "Faction: Railroad", "Faction: Institute" for third-party mods. Updated Survivalist Go-Bags to version 1.4. Updated Better Companions to 1.16. Added Armorsmith Extended compatibility patch for We Are The Minutemen. 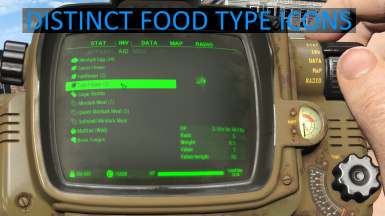 Added ESP replacer patch for Survival Quick Save 1.2.1. Fixed Empty Bottles weights and values for consistency with base mod. Updated Tsuki no Hana to version 1.5, plus Overpowered and Balanced versions. Updated Automatron Securitron to version 1.2. Added Submarine Base Echo version 6F. 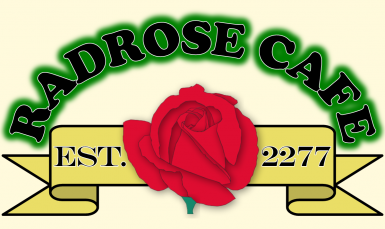 Updated Heather Casdin to 1.01. Added Quest Tag icons for both Large and Small versions. Updated version tags in BTInteriors, Gentec Weapons. Added Nora Companion, DOOM Weapons Merged, Extended weapon mods. Added Dave's Poses, Legionary's Gear, Enclave X-02 Power Armor, Chinese Stealth Suit. Added We Are The Minutemen, Campsite - Simple Wasteland Camping. Fixes install detection for Vault 1080. Reverted Big Junk patch to 2.5 to match current online version of the mod. The 2.6 patch is still available under "Deprecated Mods". Fixed inconsistent (Currency) and (Valuable) tags. 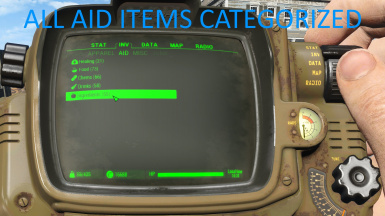 Separates AID and MISC Device subcategories, merges Quest and Currency categories. Automated installer selects patches for your installed mods. 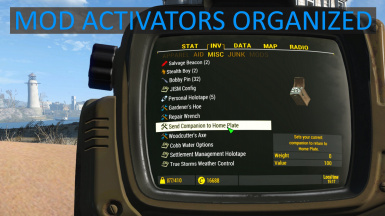 Adds Journal of the Sole Survivor, Companion Whistle, The Wild Wasteland, Ballistic Dog Gear, Gunsmith Extended, Chem Redux, Herbal Remedies, Automatron Securitron, Immersive Scrapping, Legendary Modification, Love to Craft Legendary, Mo Betta Scrap. Adds Recruitable Settlers, Settlemods Collection and standalone Settlemods. Updated Scavenger_The search for scrap, VAFS, Skibadaa Weapon Pack, The Mercenary, Heather Casdin. Normalized all Trash items to be worthless and have weight equal to their non-Trash equivalents. Includes Valdacil Item Sorting VIS patches for many popular mods! New from 2.0! Automatically installs patches for your active mods! 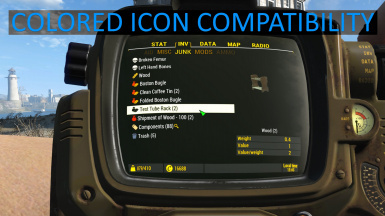 New icons and categories for the Pip-Boy, inventory, and trading screens! 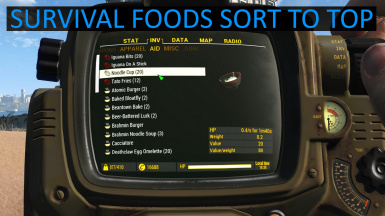 Further improves Fallout 4 inventory management! - Sorting patches for many companion, quest, and gameplay mods! 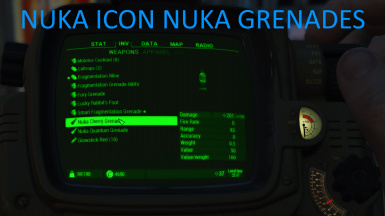 - Junk items used in crafting categorized separately as "Components"
- For a Green theme Color Pip-Boy and various gameplay enhancements try Radrose Gameplay Enhancements. 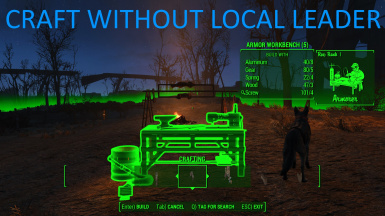 - During travel with a weak laptop that couldn't run Fallout 4, I made a Fallout 3 version. 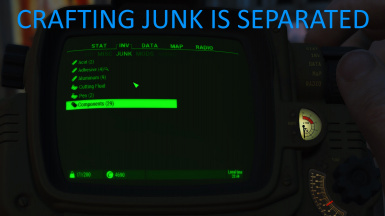 NOTE: Only the "Vanilla Weight" and "BetterJunk+DEF_INV" options are supported. Other options will have mixed results. NOTE: An "All DLC" integrated patch option is also included! 3. Select desired options in installation dialog NOTE: Only select patches for mods you have installed! The large number of individual patches eats into the total FO4 mod limit of 255 active ESM+ESP files. Users with a large number of mods are strongly recommended to create a custom merged patch. Install normally, then create a merged patch for al RUE patches you selected during installation. FO4Edit by zilav. [/b]Here is a video tutorial for FNVEdit, though the process is the same using FO4Edit. Base Game, DLC, Valdacil, Mods, VIS Patches, RUE, RUE Patches. Most sorting mods are compatible, with some caveats. Radrose Usability Enhancements ("RUE") uses the default ICONLIBS2 icon library file provided by Valdacil's Item Sorting. It includes all Valdacil icon definitions from DEF_INV_TAGS. → All mods using VIS-defined icon tags will work perfectly. Sim Settlements Building Plans Preview by ArcherDown includes a subset of RUI tags. → Load RUE after this mod, and overwrite DEF_INV_TAGS. RUE includes many custom tags from other VIS patch mods that modify DEF_INV_TAGS are also compatible. → Load RUE after other mods, and overwrite DEF_INV_TAGS. → For missing tags, post a bug with a link to the mod, the tag name, and preferred icon. Include a screenshot if possible so I can add compatibility in a later version. Mods that modify DEF_INV_TABS or lyrConf will be partially compatible. HTnTK and Horizon custom icons are included in RUE, but subcategories follow RUE pattern. This is due to a total limit of 16 subcategories in DEF_UI. → Load RUE after these mods, and overwrite DEF_INV_TAGS, DEF_INV_TABS, and lyrConf. Any other mods' custom icon tags not included in RUE will be shown in-game as-is aka "(Tag) Tagged Item"
→ Post a bug with a link to the mod, the tag name, and preferred icon. Colored icon libraries using Valdacil icon definitions are compatible. → Load RUE after these mods, and overwrite DEF_INV_TAGS. 1.1 to 1.2: ESP names have changed, so a warning will show when first loading an existing save. 1.2 to 1.3: ESP name for Sleep or Save was changed, and Kor_Scrapper replaced with Kor_Scavenger. 1.3 to 1.4: Some items move to different categories. Patch ESPs added for additional mods. 1.4 to 1.5: Reduced ESP count for RUE standard options; warning may show when loading existing saves. 1.5 to 1.6: Some new item tags, added some missing scrap component tags. 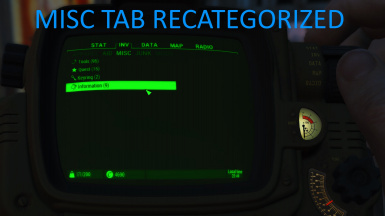 1.6 to 1.7: Trade and Container tabs are changed to better match Pip-Boy categories. 1.7 to 1.8: Additional VIS patches; no upgrade issues. 1.8 to 2.1: Automatic detection of installed mods, fixed disappearing Devices subcategory. 2.1 to 2.5: Bug fixes and additional patches; no upgrade issues. Mod authors who want to take advantage of the new categories can use the new tags added below. Many tags share the same icons; they are separate to allow for new icons to be added in future. → Custom icon libraries can also be supported: if you would like support added, please contact me.